An interesting feature of all the notes that you will see about Spanish pottery is that there’s no mention of tin glaze. That’s because virtually all pottery made in Spain is tin glaze and drawing attention to the fact is like drawing attention to the fact that it’s made of clay. So take it as read that all the pots and tiles shown here are tin glazed. 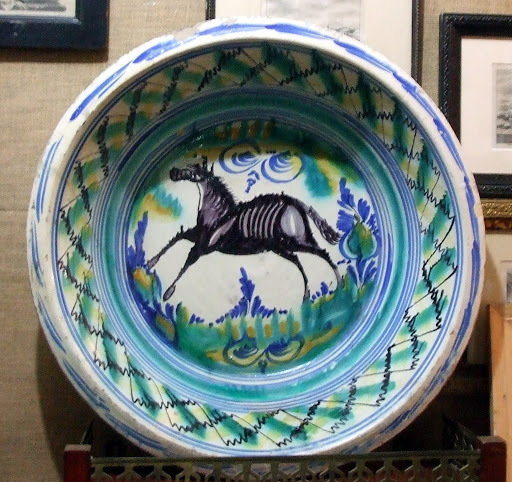 This is a large 19th century basin, about 60cm in diameter, from Seville, which was used in the kitchen. 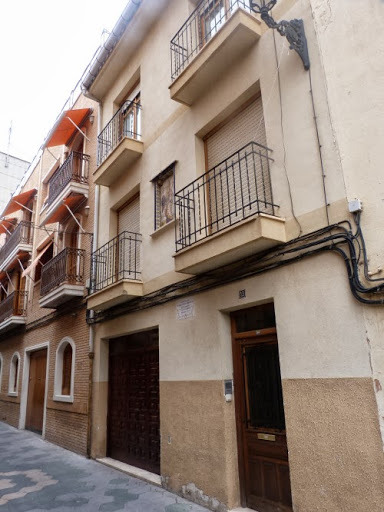 It’s typical of the basins (or lebrillos) made in the Triana district at that time, vigorously painted on tin glaze in blue, green, yellow and black with a characteristic border and a motif in the centre, either a bird, an animal a portrait or an abstract pattern. Triana is the area of Seville where the potters have worked for centuries. The dish is made from a pale buff clay, of which there were abundant deposits in Seville and which was the foundation of its ceramic industry, dating to Roman times and still flourishing. The dish is from the collection of Laura Salcines, who has an excellent shop, Populart, at 4 Passaje de Vila, near the cathedral in Seville. 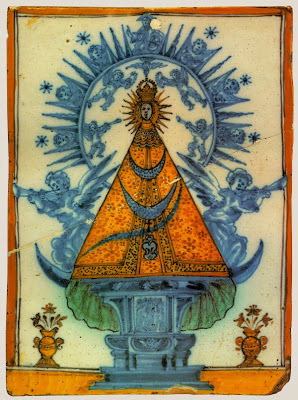 Mrs Salcines has produced a book about her collection of Sevillian azulejos (tiles) but has made only one copy. As Mrs Salcines doesn’t speak English and I don’t speak Spanish, I couldn’t be sure exactly what this superb piece of pottery was used for, but it had something to do with pork. 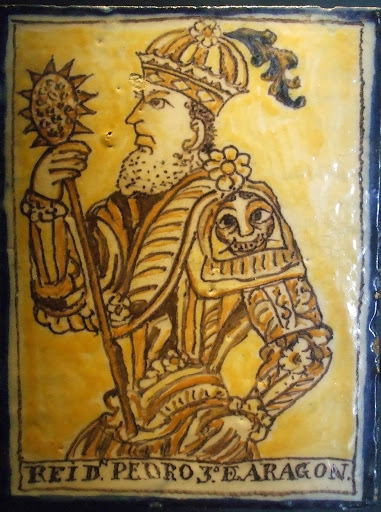 There’s a good historical review of ceramics in the Alcazar Real, the Collecion Carranza, covering the 15th to 19th centuries, with examples of Renaissance, Baroque and Rococo pottery and the azulejos made in Triana, including some fine early religious tile paintings, a genre still in production, made to commission from churches throughout Spain. The notes to the exhibition, in English as well as Spanish are good. The Carranza collection call the age of baroque tiles the Golden Age, which is moot. A common view outside Spain, especially among artist potters, is that the Hispano Moresque period (from the 12th to the 15th centuries) is the golden age of Spanish pottery and that there was a steady decline thereafter. Curators and academics, for example, Alice Wilson Frothingham, tend to take a broader view, but potters are more interested in vessels, and Spain has lavished much of its ceramic effort on tiles. 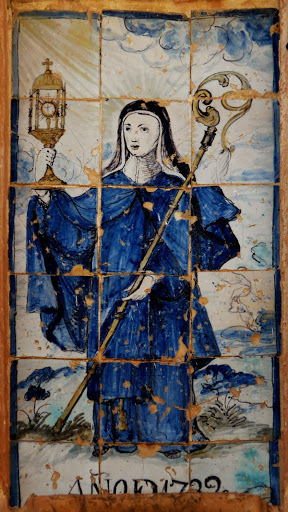 The motivation for the tile makers was often religious, and artistic considerations were secondary, so the quality of the drawing is sometimes poor. But but the limitations of the medium – a few colours and the impossibility of correcting what is painted on the glaze – result in simplicity and directness. 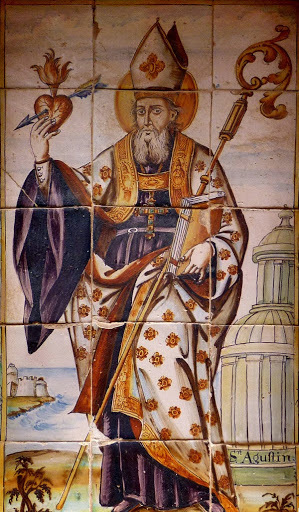 That, and the fact that the colours do not fade or darken like paint means that Spain has a wealth of street art, some of it outside churches and some in mundane places, on buildings now used as flats or corner shops, as in the example of St Augustine, below, who appears between the two balconies on the first floor. 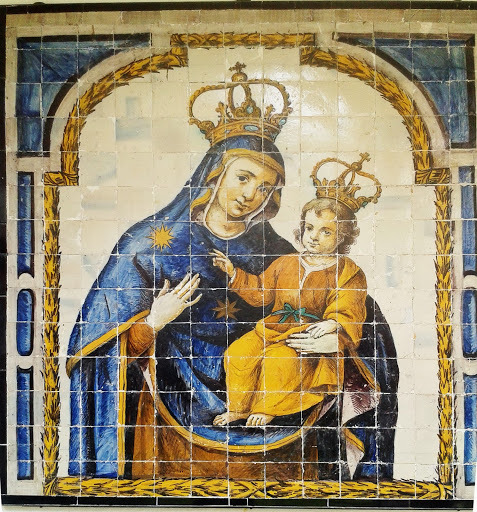 They have documented hundreds of azulejos, mainly religious, in Spain’s churches and other public places, covering a period of over 500 years. It records an essentially conservative art, almost a folk art except that the painters are professionals and specialists in tile painting. The Alcazar Real, a UNESCO world heritage site, has a small museum of ceramics from the Collecion and a large chapel whose walls are covered in tiles painted with arabesques, bouquets and grotesque figures. These wall paintings, from about 1600, are different from Hispano Moresque painting but they’re just as good in their own way. The colours are rich, dominated here by Naples yellow, and the drawing is fluent. Modern tile work (for example the panels in the Plaza de España done in 1929 with the benefit of a much wider range of colours) is often stilted. Here are a few panels of the quasi-human figures in the Alcazar chapel. The Virgin Mary,”Nuestra Señora”, Our Lady, is a contant in Spanish Catholicism, especially in the south. In the bars of Triana you will see pictures on the walls of footballers, bullfighters and Nuestra Señora, all apparently venerated in the same way. The church shop of Santa Ana is like a football supporter’s shop where you can buy posters and postcards of the Virgin’s image in the church, shirts and other memorabilia. Have just started reading Daphne Carnegy's “Maiolica” and am full of awe and admiration at all that dedicated labour from you and the other potters illustrated. thanks again.